Dyche feels Vokes-Crouch deal will be "win-win in the end"
Sean Dyche admits it is "really difficult" to let Sam Vokes leave Turf Moor for Stoke City. But he hopes the imminent arrival of Peter Crouch from the Potters could be a "win-win situation." The transfers are set to be officially confirmed well in advance of the 11 p.m. deadline tonight, in a separate deal - Vokes is joining Stoke for a fee believed to be in the region of £10m, of which former club Wolves are due 25% of the profit after his £350,000 move in July 2012. And Crouch then comes the other way on a deal to the end of the season, on a free transfer. 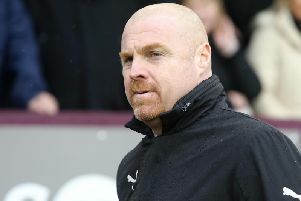 Vokes goes having played a huge part in the most successful spell in the club's history in the last four decades, and, asked whether it was a tough decision to allow the Wales striker to leave, Dyche said: "Really difficult, Sam's proved what a good player he is, and what a good player he's been for us, but I think he hasn't played as regularly as of late, he was a little bit frustrated with that, as players do get, and I think it was an opportunity for him that could work in many ways and becomes a win-win in the end. "There is a business model at this club, and when a figure gets to the right level, there has to be a decision made. "If it also fits the player, the situation has to be considered, and in this case, all those things aligned. "But I take great value in Sam as a player and a person, and what he's done for himself and the club. "He's become an important figure and earned the right. "But players move on, and he's going to a very good club and we wish him well." Dyche played against Crouch in the early 2000s when he was with Watford, and Crouch with Portsmouth - who he joined ahead of Burnley after the riots of 2001. Stan Ternent, in his book Stan The Man - A Hard Life In Football - said of the potential move: "I persuaded him to come north and we sat in my kitchen to discuss his move. He liked the look of the place. So did his agent. "Then, the next night, 300 white blokes and 300 Asians restaged the Battle of Stalingrad in Burnley town centre and the deal was off. Days after a race riot had portrayed nearby Oldham as a backward hick town torn apart by primitive hatreds, it happened in Burnley. Thank you very much, lads." Dyche said of Crouch: "I've known Crouchy down the years, seen him play, always admired that he knows what he is, he's never bothered with other people's opinions, other than getting on with the game, and that's important." Crouch was 38 yesterday, but Dyche isn't concerned by his birth certificate: "I've never been too bothered about people's age, we had Michael Duff, a fantastic servant to this club, and also for myself, at 37, in the Premier League, so that's not an issue. "I know about his fitness, about his distances covered, and I think there's an intent and desire to still make a mark on football. "Over time he will come to a decision, when that's due, but at this moment in time he has a hunger to come in and make a mark. "He brings experience, of course, we know what a good character he is, so that's important - we want people who fit into the group, I think he still has that edge and wants to still play and be effective, and everyone knows he is an effective player. "We know he has a very good touch, understands the game, he's never had to rely on pace because of his awareness, and the main thing is having motivated people. "I don't factor age in when people are as motivated as these guys, Michael Duff and big Crouchy is similar." That deal looks likely to be the only incoming today, as Dyche added: "i think it's improbable, you never know, but it's improbable. The Vokes thing has been in the background for a while, there was a maybe chance, and it started to warm up at the beginning of the week, and the ;level of finance got more serious, but I think it's unlikely anything else gets done."